Traveling can provide new experiences that one can share with others. A recent trip provided just such an opportunity in Virgil’s Blueberry Pomegranate. For those unfamiliar with Virgil’s it is a company that produces high quality all natural soda beverages in a wide variety of flavors. Having tried several of the Virgil’s flavors before, I jumped at the chance to purchase a variety that I had yet to imbibe. So back at my temporary abode I chill my new found glass friend and set out to do a review. The ingredients list of any Virgil’s product typically provides the consumer with items that are both familiar and easy to pronounce, and good to drink too. This variety proved no exception and I will relay the main ingredients now. Water, juices from apple, pear, grape, and blueberry. Also included: citric acid, natural flavoring, and coloring. Simple stuff for sure. The front of the bottle describes this incarnation of Virgil’s as an “All natural Juice beverage” which I think sounds cool. So I open the bottle and take a ravenous gulp. Glorious flavor resonates in my oral cavity like an angelic host. Succulent blueberry flavor and decadent pomegranate flavor intersect with the perfect amount of carbonation to form a magnificent concoction that can only be described as other worldly. Needless to say more gulps are taken, which are followed by more gulps. The bottle is quickly consumed and a plus one can certainly be added to Virgil’s satisfied customer list. 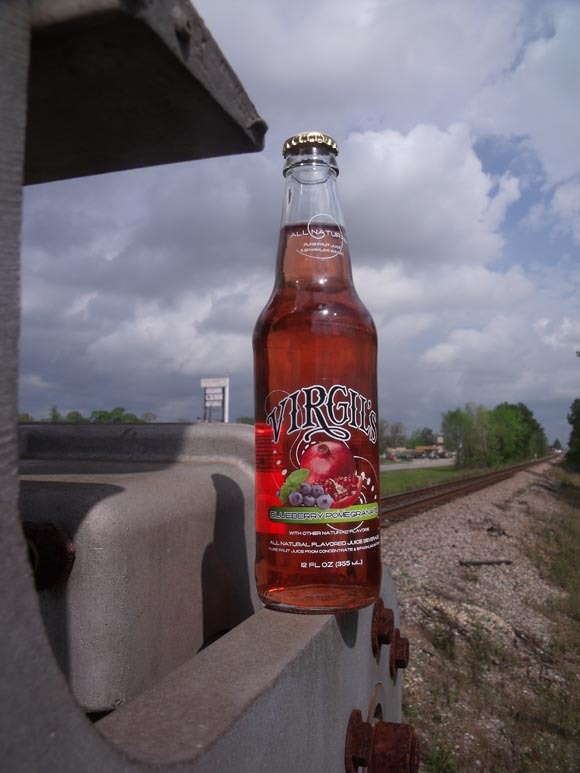 I must say, I have been impressed with other Virgil's flavors and am certainly impressed with Blueberry Pomegranate! Final review: Buy a pallet! Yeah, buy some of this stuff it’s great!